Reference to the movie Mars Attacks! "The Owner of Mars Attacks" is the third comic issue. Released 28 March, 2001 in the US. The staff of Planet Express shop around a flea market. Leela meets up with Inez Wong who encourages her (and Zoidberg) to start collecting "Needy Newbies", including inviting them to her weekly collectors meeting. Meanwhile, Bender meets Randy and makes a deal selling crap to him. At the meeting, Leela defends Zoidberg and gets in an argument with Mrs. Wong and threatens to prevent her from getting the last two Newbies she needs. Bender and Randy steal things from around the office. 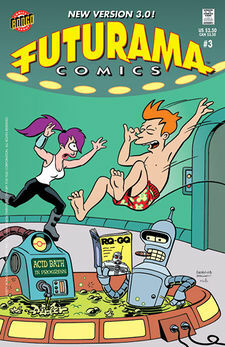 Leela and Fry go on a delivery, but take a detour to the flea market to try and beat Mrs. Wong to a Newbie. Failing to beat Mrs. Wong, they find some parts missing from the ship at Randy's stand and buy them. Leela finds out where she can get the last Newbie. The Professor calls to inform her that the newbies are designed to join together and destroy humanity, which he discovered when her and Zoidberg's newbies joined. The ship is damaged on the way to the planet Nosferatu lV, Inez is already there, however Zoidberg bought it already, with blood which the seller intends to use to use as protection payments against the local vampires. Inez's car won't start so she gets a ride with the others in Zoidberg's hover-caddy. Against Zoidberg's wishes, the Professor demonstrates how the newbies join and Inez gives up collecting them. Zoidberg owns a Hover-Caddy, which he lives in. Wong Ranch is seen to hold buggalo, cows, kangaroos and at least one horse. Of Randy's "crap" he believes the only thing no one will buy is his complete 723 episode box set of Family Guy. Other members of Inez's group included LaBarbara, Larry and Hattie. After Inez gives up on collecting Newbies, she says she wants a grandchild and drags Amy away to find a husband. This means that Inez and Leo's obsession for having a grandchild probably began after the events of this comic. Professor: It's a shipment of used dentures for laser dental floss testing. Why, now that I think about it... now would be a good time to trade up! Zapp has been selling a video of when he and Leela first "met" in "Love's Labours Lost in Space". A Needy Newbie appears at the carnival in "Rust in Peace". Head Museum clearance sale. $1.98 per head.